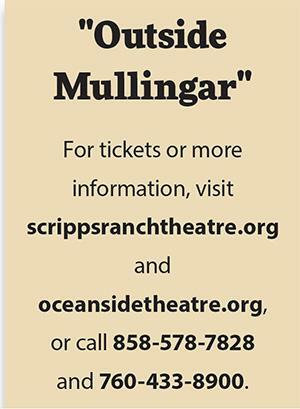 Since late January, a number of local theatergoers have experienced the co-production of Scripps Ranch Theatre and Oceanside Theatre Company’s interpretation of the romantic comedy “Outside Mullingar.” John Patrick Shanley’s script features several quirky characters whose lives are far from normal. 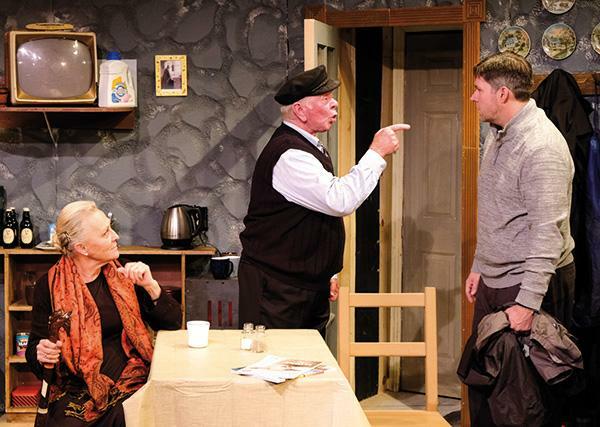 The evening revolves around an unusual relationship between longtime neighbors living in the Midlands of Ireland: Anthony Reilly (Steven Schmitz) and Rosemary Muldoon (Vanessa Dinning). Rosemary deeply cares about Anthony, but he seems hesitant and nervous to start a serious relationship. Another conflict that builds is whether Anthony’s dad, Tony (Jim Chovick) should sell his farm to his nephew, or if he should give his son the land. 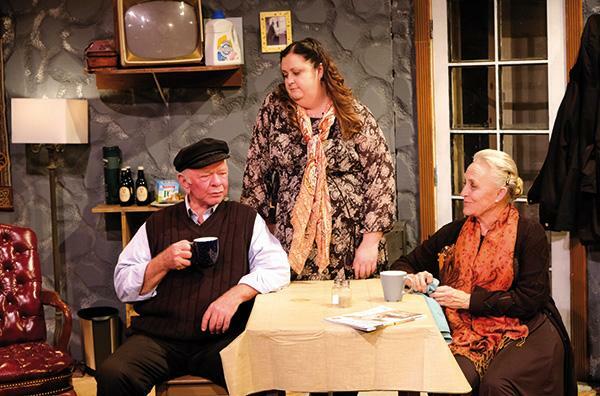 All three performers in “Outside Mullingar” hail from different San Diego neighborhoods. Schmitz lives in Morena, Chovick is a Mission Valley resident and the English-born Dinning currently calls Bankers Hill home. For about 15 years, Dinning was a tour guide around the UK and Ireland for an American high school educational company, so she is very familiar with Mullingar. 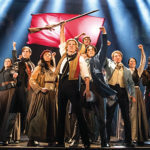 Before opening night, Dinning shared stories about her experiences in Ireland to give the cast more appreciation for the country. Shanley’s authentic dialogue requires performers to speak with believable Irish accents. As the dialect coach, Dinning aids the performers with saying each line as correctly as possible. Teaching an Irish accent to others hasn’t been an issue for Dinning, as she’s taught it to others many times in the past. Chovick is open to visiting Ireland in the future. He plays the important role of the judgmental and death-obsessed Tony. While he might not always treat his son with respect, Tony’s sense of humor and growth as a person make him a likable parent. 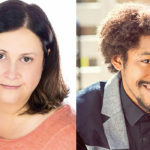 One aspect that attracted Chovick to the production was the opportunity to work again with Moonlight’s former artistic director, Kathy Brombacher. 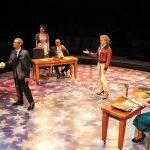 After “Outside Mullingar” closes on Feb. 18, director Brombacher’s version will leave the Scripps Ranch Theatre and find a new home at the Brooks Theatre, with performances starting on Feb. 23. When Dinning lived in the UK, she often toured different cities. Though Dinning might be used to this process, this is the first time Chovick has been involved in a show that transfers to a different theater. Yet he doesn’t anticipate the move being a hard adjustment. 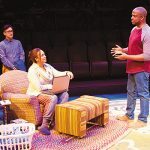 The box office for “Outside Mullingar” has been strong so far, and Chovick notes theatergoers appear emotionally invested in the central plot. In a similar fashion to Chovick, Dinning loves Shanley’s script and empathy for the characters. 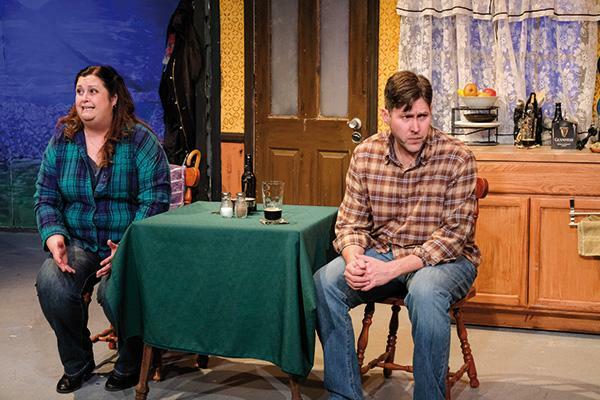 Regardless of where you see “Outside Mullingar,” Dinning and Chovick’s performances, Brombacher’s moving storytelling, and Shanley’s wit are only a few of the reasons why the unconventional comedy is well worth the visit. Shanley’s plot is also timely for romantics who want to celebrate an early or belated Valentine’s Day. 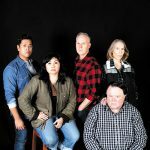 “Outside Mullingar” runs through Feb. 18 at the Scripps Ranch Theatre and plays at the Brooks Theatre Feb. 23 through March 11.